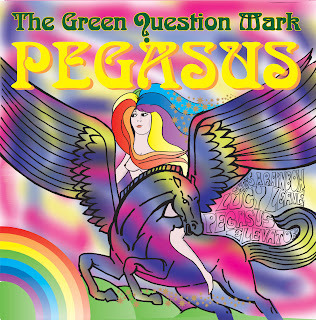 I’m not clear on whether Pegasus by The Green ?uestion Mark is a one-shot collaboration on some vintage psychedelic tunes, or the debut from a new British band. The members consist of radio personality/vocalist Marrs Bonfire; producer Icarus Peel; eccentric musician Mordecai Smyth (whose Sticky Tape And Rust album was favorably reviewed here on Broken Hearted Toy); and the mysterious Chrystal Jacqueline, who’s simply described as ‘talented.’ One thing is for sure: None of these people are using their real names. That said, The Green ?uestion Mark’s Pegasus EP, which is available as a limited edition green vinyl record as well as in digital form, is a lot of fun. Of course, any band that features an obscure Hollies tune as its title track is likely to snag a favorable write-up on BHT. Bonfire and his mates give “Pegasus,” (which was originally a rare opportunity for guitarist/harmony vocalist Tony Hicks to sing lead) an arrangement reminiscent of The Hollies mid-1960s classic LPs, Evolution and Butterfly. The Green ?uestion Mark’s take on “She’s A Rainbow” is more ornate than the Rolling Stones version but still rousing, while their cover of Syd Barrett’s “Lucy Leave” comes across as energetic garage rock. The EP closes with a cover of Grapefruit’s “Elevator” that switches to an instrumental at the minute and a half mark. It should be interesting to see what The Green ?uestion Mark does next. In the meantime, Mordecai Smyth has a new release due out in the coming months. Earlier on Broken Hearted Toy, I reviewed a new CD by Norwood Park All Stars, a collection of musicians from bands that had been part of Chicago’s vital punk scene in the 1990s. 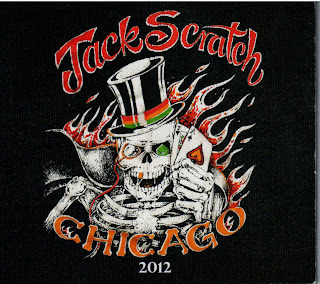 Vocalist Dave Bergeron was a driving force in putting that project together, and he’s also at the helm of Jack Scratch’s recently released reunion effort, 2012. 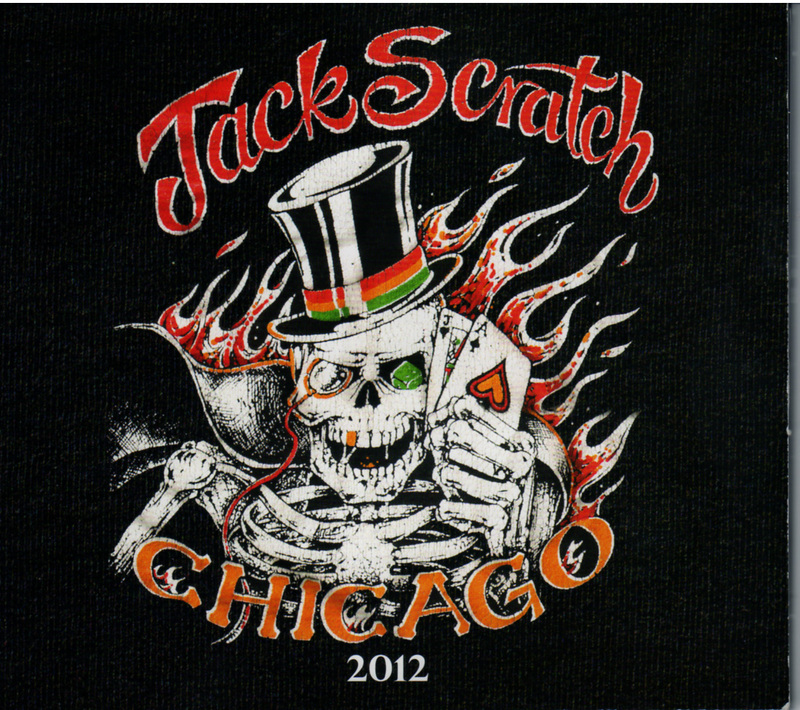 Back after a 20-year absence, Jack Scratch fills the 13 tracks with authentic energy and attitude. It’s tempting to describe the CD in terms like “a high-speed drive back to punk’s heyday,” but it feels more like the work of musicians who never abandoned punk, for people who’ve always loved it. High-speed guitars and call-and-response vocals propel the melodic “Hold On Me,” and Jack Scratch brings funky grooves to the social satire of “Passion Fashion.” “Indeed” lets bassist Bob Byrnes cut loose, while drummer Keith Robbins kicks off “When Worlds Collide” and “See Saw.” Guitarists Earl Letiecq and Fran Kondorf never seem to take a break, and Bergeron consistently delivers the intense vocals you expect from a punk frontman. Not as priceless as Paul McCartney’s hand-written lyrics, but still pretty cool. The Chicago area looked like a world without love last night as a freezing rain covered the streets and sidewalks with a treacherous sheet of ice. 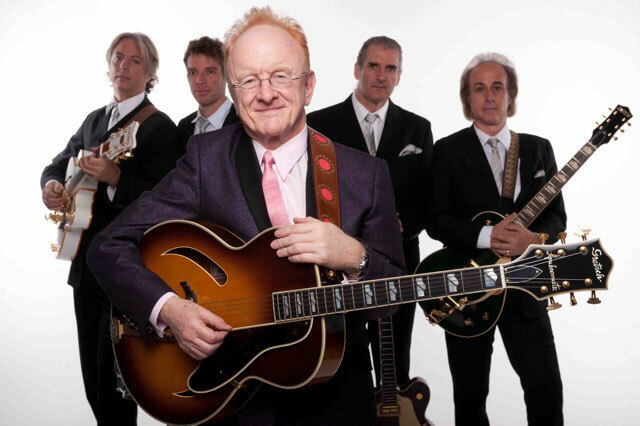 But it didn't stop Peter Asher from drawing a capacity crowd to the Old Town School Of Folk Music for his multi-media show, A Musical Memoir Of The 60s And Beyond. Backed by a highly polished live band, Asher, formerly half of Peter And Gordon, served up a mix of live songs like “I Go To Pieces” and “500 Miles,” photographs, and vintage clips. There was also a good deal of humor, starting with a videotaped intro by Eric Idle, who interacted with Asher as if he was really there. Asher conceded that at least some of the audience members had no idea what they had come to see. But those of us who had caught a similar presentation at Fest For Beatle Fans - Chicago a few years back, loved the concept, and were back for more. 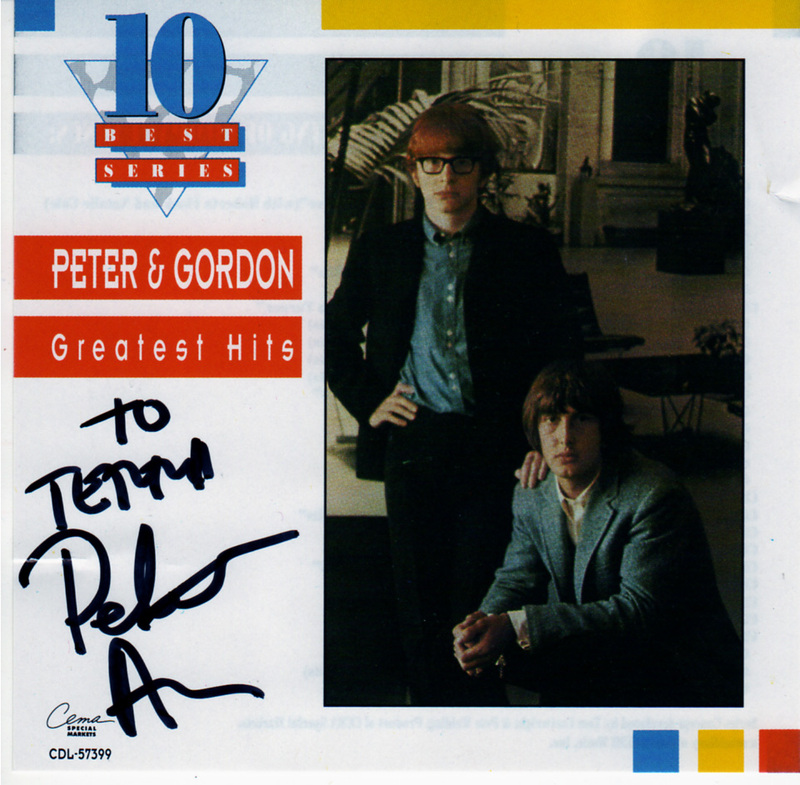 The first half of A Musical Memoir covered the origins of Peter And Gordon, placed in the context of post World War II England, and later, Beatlemania. Back then, Paul McCartney was dating Asher's sister, actress/TV personality, Jane, and frequently stayed at the Asher home when he was in town. The friendship between Peter Asher and McCartney resulted in the Beatle giving “World Without Love” to the fledgling Peter And Gordon to record. It became their first big hit single, and Asher still has McCartney’s handwritten lyrics. One of the new highlights was a demo of McCartney singing “World Without Love” that Asher recently discovered among his artifacts. He recalled the day when McCartney and John Lennon spent some time practicing on a piano at the Asher home, and then invited him to be the first to hear their new song, “I Want To Hold Your Hand.” McCartney would later compose “Woman” for Peter & Gordon, under the pseudonym Bernard Webb to prove he could write a hit single without the popularity of The Beatles behind it. Asher delivered a funny running commentary on clips of Peter And Gordon on The Ed Sullivan Show and being good sports while acting silly on Hullabaloo and The Red Skelton Hour. The second half of the show kicked off with “Lady Godiva,” as Asher recalled that he initially thought the bawdy song didn't measure up to Peter & Gordon's standards. From there, he discussed his role in The Beatles' ill-fated Apple corporation; his development as a highly sought after producer for artists like James Taylor, Diana Ross, and Linda Ronstadt; and his more recent work on film soundtracks. After wrapping up an entertaining evening with a sing-a-long for “World Without Love,” Asher met with fans to chat and sign autographs. 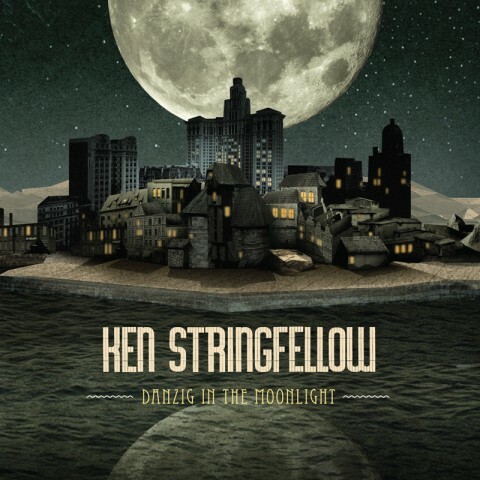 Ken Stringfellow just kicked off a manic tour that will bring him to Schubas in Chicago on February 9th. I had the honor of doing a phone interview with him last week for an upcoming piece in the Illinois Entertainer. Our conversation touched on the tour, as well as his eclectic and well-crafted new solo effort, Danzig In The Moonlight. Alternative rock band Whitewolfsonicprincess has a 10 o’clock show tomorrow night at Gallery Cabaret on Chicago’s north side. Christina Trulio and Gunnelpumpers are also scheduled to perform. Co-ed power pop band, The Right Tidys, are part of a triple bill with Velvet Cadillacs and Red Wigglers scheduled for Phyllis’ Musical Inn next Saturday, February 2nd. The Right Tidys have been working on a CD that will hopefully come up later this year. There will be a mind-bending experience at Martyrs on February 9th, when four acts -- The Luck Of Eden Hall, The Red Plastic Buddha, Energy Crown, and Umbra and the Volcan Siege -- take part in a Psychedelic Saturday. I have praised CDs by The Luck Of Eden Hall and Red Plastic Buddha previously on BHT. I’m not familiar with the other two bands, but their names certainly sound intriguing. The event will also include visuals by brownshoeonly. This Is This will be performing at Mac’s On Slade, a new venue in my bustling hometown of Palatine, tomorrow night. In my review of the trio’s latest CD, The Hours, The Minutes And The Days, I noted they “keep things interesting by infusing their mainstream rock songs with elements of other genres. Songwriters Petitt and Torres once again put an emphasis on fetching melodies, and take turns on lead vocals.” In addition to enjoying the music, visitors to Mac’s On Slade might get a glimpse of a few future famous authors. Sopro, a company based on Chicago’s southwest side, has been booking rock, blues, and jazz concerts since the late 1970s. It has also released CDs on is own label, and is now expanding into publishing. Founding member Bud Monaco’s Drafted: You’re In The Army Now gives a firsthand look at his Army days from 1969 -1971, when he was stationed in Panama. The press release describes the effort as scary, informative, and occasionally hilarious. Somehow, it’s hard for those of us who’ve known Monaco all these years to picture the perennially long-haired rock and roller with a military buzz cut. Chicago-based musician Ellis Clark is raising funds for an upcoming limited edition vinyl LP. Clark currently plays guitar and keyboards with The Handcuffs, and his extensive band resume includes time with Social Act and Epicycle. Judging from Clark's Facebook post, his new solo effort leans toward the power pop he pursued with Epicycle, augmented with harmony vocals, strings, and trumpets. The solo record will have a pressing of just 250 copies, and is available for pre-order via Clark's Indiegogo site. The Punk News website has a story on an upcoming Go-Go’s tribute album titled Our Lips Are Sealed, featuring covers by 14 punk rock bands. The compilation, from Solidarity Recordings, is set to be released on vinyl and CD sometime this Spring. Chicago band Terrible Spaceship has hit upon an innovative and fun idea for its debut release. Invaders 1938 matches the vintage radio broadcast of War Of The Worlds with original electronic and hip hop backdrops that range from catchy to experimental. “Lost” simultaneously evokes The B-52’s and Santana, while “Wiped Out” mixes in a bit of classical music. Somewhere, Orson Welles is break dancing on his head. Terrible Spaceship has a gig at Martyrs on February 16th. The Second Disc online newsletter regularly casts a spotlight on upcoming vinyl and CD releases that are likely to delight power pop fans. 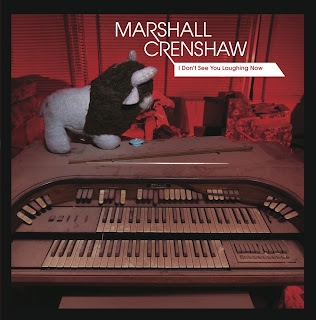 The latest example came today as The Second Disc broke the news about a series of 45 RPM EPs on 10"vinyl from Marshall Crenshaw. Each platter will follow the format of one new song, one cover, and one revised gem from the Crenshaw catalog. 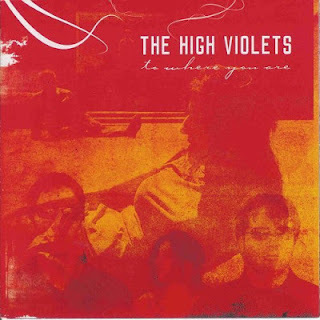 The first release, I Don't See You Laughing Now, includes the title track, which reportedly features Graham Maby from Joe Jackson’s band on bass; a cover of The Move's "No Time,"recorded with Glen Burtnik from the Beatles cover band Liverpool, on guitar and vocals; and a live recording with The Bottle Rockets of "There She Goes Again." 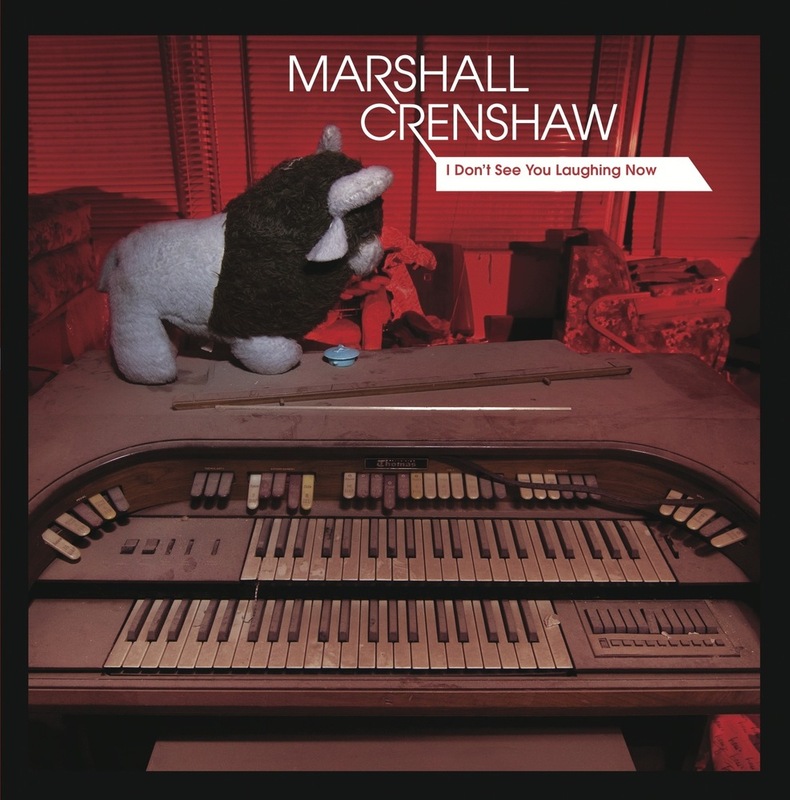 The EPs can be purchased separately or in a batch of three on Crenshaw's website. Better hurry. The limited edition red vinyl version has already sold out. I know this post’s title is an inside joke that only Marshall Crenshaw fans will get, but hopefully someone besides me will think it’s clever. 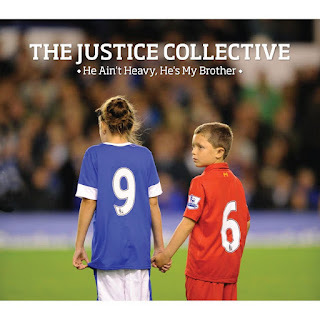 Toward the end of November, I did a post about The Justice Collective’s re-recording of the Hollies’ hit, “He Ain't Heavy, He’s My Brother.” The all-star band had hoped their version would become the U.K.’s Number One Christmas Single for 2012, and I’m happy to report they’ve succeeded. Last year, The Justice Collective gathered several well-known English musicians, including Paul McCartney, Robbie Williams, Glen Tilbrook from Squeeze, Gerry Marsden from Gerry And The Pacemakers, Shane McGowan from The Pogues, Mick Jones from The Clash, John Power from Cast, Dave McCabe from The Zutons, Chris Sharrock from Oasis, Holly Johnson from Frankie Goes To Hollywood, and Melanie C from The Spice Girls, to help families of the victims of The Hillsborough Disaster. In 1989, 96 Liverpool soccer fans were killed during a Football Association Cup Semi-Final match with Nottingham Forest at the Hillsborough Stadium in Sheffield. Tony Hicks and Bobby Elliott, original (and still current) members from The Hollies, were asked to join in, and gladly obliged. The Liverpool Philharmonic Orchestra and LIPA Gospel Choir were also involved, as were a few former members of the Liverpool soccer team. The new version has the same gorgeous harmonica intro as the original, this time played by musician Will Pound, and the arrangement stays faithful to The Hollies hit. The various stars take turns on lead vocals; McCartney and Jones contribute guitar solos and Sharrock plays drums. The Justice Collective's “He Ain't Heavy, He’s My Brother” is available on iTunes, and the actual CD single can be purchased from Amazon. And to get the full impact of this inspiring rendition, I highly recommend watching the video. Art from The Sw!ms Facebook page. No one could accuse The Sw!ms of taking themselves too seriously or of getting stuck in a musical rut. 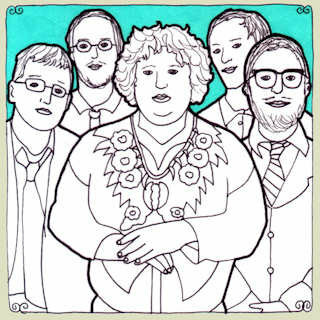 The Philadelphia-based band leaps from one genre to another on its debut, Ride The Blueberry Winter. Guitarist-vocalist Brian Langain sounds like he’s singing with a perpetual smirk as he leads his band mates through 16 catchy tunes with twisted lyrics. Poster artwork from Androgynous Mustache Facebook page. 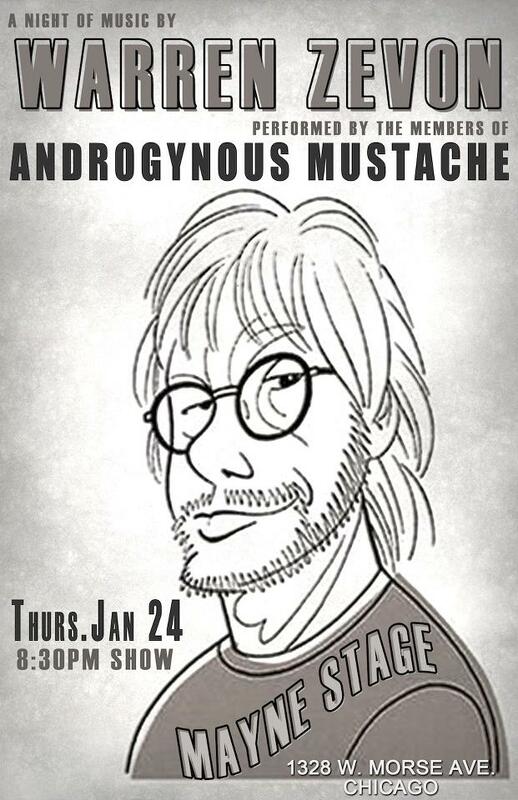 Androgynous Mustache will be performing songs by Warren Zevon as part of a Birthday Bash being held for the late singer this Thursday night, January 24th, at Mayne Stage on Chicago’s north side. 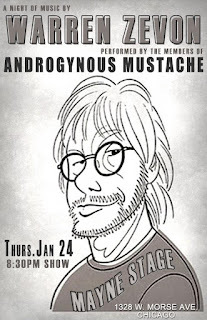 Androgynous Mustache did a fantastic job of covering The Replacements at a Halloween Tribute show at Martyrs’ last year, so their take on Warren Zevon should be interesting. Archie Powell And the Exports, who nabbed the Number 2 spot on the Broken Hearted Toy Top 40 CDs of 2012 list, have a show at Goose Island in Wrigleyville on January 25th to benefit the My Sandy Hook Family Fund. The event’s promoters, Vicarious Venues, have promised to match the amount raised by Archie Powell And The Exports. The bands Mutts, Brother George, and 500 Miles to Memphis are also on the bill. Miles Austrevich was the inspiration for Jokes4Miles, an organization created by stand-up comedian Len Austrevich as a means to help his son cope with brain cancer. While Len worked tirelessly behind the scenes, it was Miles who captured the media’s attention with his quiet determination and cheerful personality. When Miles passed away shortly before Christmas, it was only natural to wonder how Jokes4Miles would continue without him. A memorial/celebration this past Saturday night at the organization’s impressive new digs at 3660 W. Irving Park Road offered some very positive signs. “How cool is it that you’re still coming out for Miles?” Spencer Tweedy asked the audience, shortly after his band, The Blisters, took the stage. Tweedy is the son of Wilco musician Jeff Tweedy and a former classmate of Mile Austrevich. The quartet of high school students strummed guitars and covered songs by The Band without the benefit of microphones, but sounded highly professional. Earlier, an indie rock musician performed a solo set, and one of Austrevich’s former teachers wove his memories of Miles into a consistently funny stand-up routine. But the most encouraging moment was when Tom and Stacey Sutter came onstage to talk about Cal’s All Star Angel Foundation, the charity they started in 2006 after their son Cal lost his battle with leukemia. The Sutters honor their son’s memory by helping the families of other children who have serious illnesses, and they had crossed paths with the Austreviches a while back. On Saturday night, Stacey Sutter echoed Len Austrevich’s earlier vow to help parents navigate the confusing and financially difficult paths of caring for a sick child. Stacey called for everyone in crowd that night to think about how they could help others in need. It looks like Jokes4Miles will continue doing that. 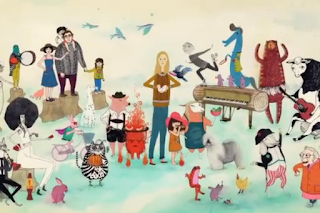 Art from the Linda McCartney Foods commercial. Congratulations to The Lennys, who are celebrating 10 years of performing with a bash tonight at Danny’s On Douglas in Elgin. Admission is $5, the music starts at 9:00 PM. Today’s Chicago Tribune picked up a story from Reuters concerning a new animated tribute to the late photographer/musician Linda McCartney. Sir Paul re-recorded “Heart Of The Country” from his Ram album to go with the clip, which the Cartoon Brew website and The Mirror have reported is part of a TV commercial for the Linda McCartney Foods company. My only complaint is that the video, which shows Linda doing what she likes best--taking pictures, spending time with children and animals, and playing music--is far too short. Many of us familiar with the Chicago area music scene were saddened to learn that Mike Braam, from the band The Braam Brothers, recently suffered a stroke. His brother and band mate, Scott, broke the news on Facebook. The overwhelming response of support and prayers has no doubt been appreciated by the Braam family. We’re all hoping Mike has a quick and full recovery. John Wicks of The Records noted on Facebook this week that he’s been having writing sessions with Debbi Peterson of The Bangles. That sounds like an interesting collaboration, and it could result in some live performances, according to an additional comment by Wicks. By the way, “That Girl Is Emily,” by John Wicks And The Records, is one of the very best tracks on International Pop Overthrow Volume 14. Danstock, a benefit concert honoring Chicago-based musician-producer Dan Stock, will be held on Thursday, February 7th at Lincoln Hall in Chicago. General admission is $20; a VIP package costs $100. There will be live performances by the bands Board Of Governors, Farkus, Nature Show, and Carta Marina, as well as a silent auction. All proceeds will benefit the Robert H. Lurie Comprehensive Cancer Center. Doors open at 7:00 PM, bands start at 8:00 PM. Lincoln Hall is located at 2424 N. Lincoln Avenue. The Postelles’ upcoming U.S. tour includes a date at Bottom Lounge in Chicago on February 25th. Other dates include Toledo, New York, Boston, and Washington, DC. Kevin Lee & The Kings have a record release show on tap for their latest CD, Breakout, April 26th at the Elbo Room. Breakout will be available for purchase on April 23rd. Good Ol’ Freda, the documentary about Beatles Fan Club secretary Freda Kelly, will have its world premiere at the South By Southwest Film Festival on March 9th. Good Ol Freda had a successful run on Kickstarter, but the documentary’s makers are still in need of more financial support. Donations can be made via the Southern Documentary Fund. Look what I started. After my story on Dolly Varden ran in the January issue of the Illinois Entertainer, the Chicago alt rock/country band has been written up in Time Out Chicago, The Chicago Tribune, and The Chicago Sun-Times. Actually, I’m sure those stories were in the works long before my profile was published. 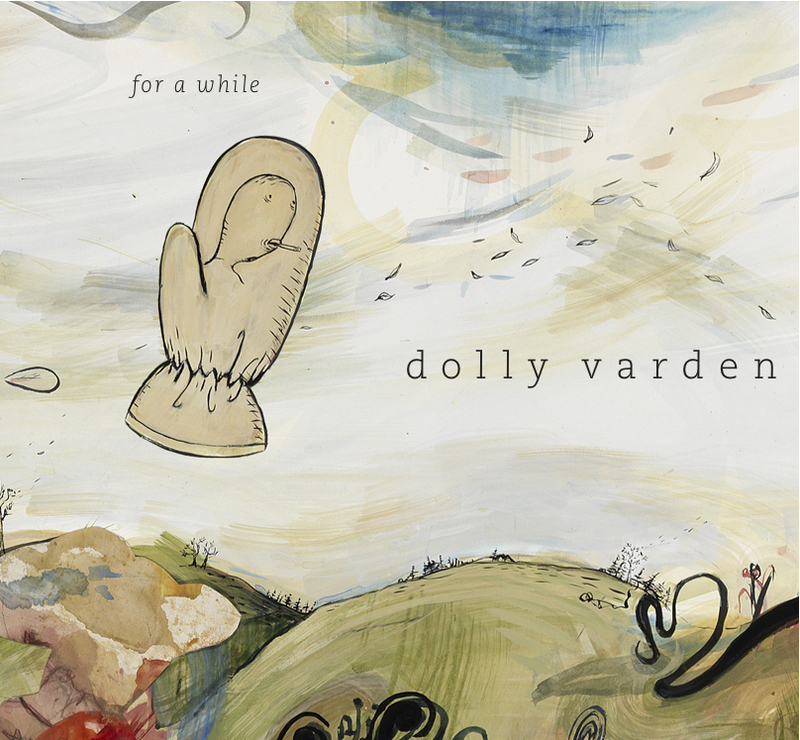 But it’s good to see Dolly Varden getting some well-deserved publicity. The band has a CD release party for its latest effort, For A While, tomorrow night at City Winery in Chicago. Earlier this week, I mentioned that Peter Asher from Peter And Gordon will be Terri Hemmert’s guest on “Breakfast With The Beatles” on WXRT in Chicago this Sunday morning from 8:00 to 10:00PM. Far away, in a different city, on a different “Breakfast With The Beatles” program, Susanna Hoffs will be serving as guest host. Her three-hour “Breakfast With The Beatles” gig in Los Angeles will be on KCSN tomorrow, starting at 10:00AM PT, 12:00PM CT, and 1:00PM ET. First, a Happy Birthday wish to Susanna Hoffs. All three current members of the Bangles are keeping busy these days. Let’s hope 2013 brings new Bangles music and concerts, along with all these interesting side projects. Now here’s a CD review that originally appeared in the Illinois Entertainer in 2006. The band’s guitarist-vocalist, Clint Sargent would later form Starry Saints, whose Serenade was one of the best releases of 2010. The High Violets' blend of cutting edge rock and ethereal arrangements on their latest effort, To Where You Are, calls to mind bands like The Delays and The Church. Singer Kaitlyn Ni Donovan has a pristine voice that can become positively haunting when matched to some of the band's more exquisite melodies. 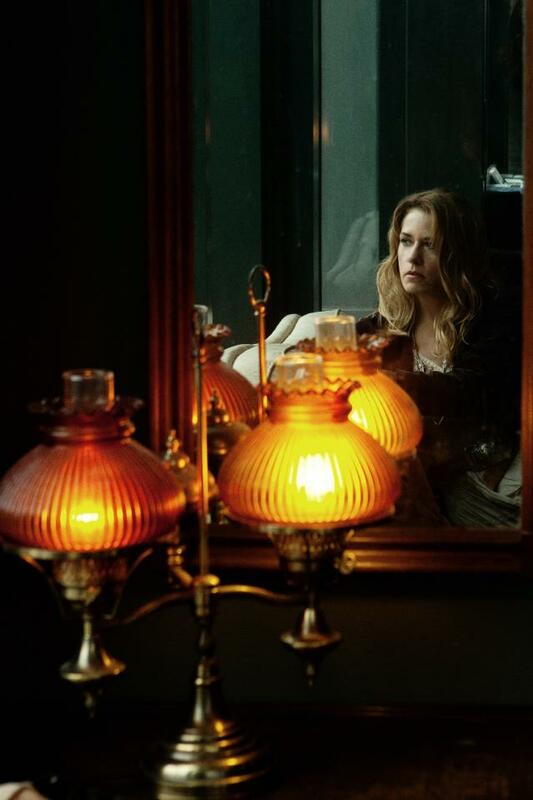 It’s no surprise when she sings, “On days like this, I'm ghost like” on the title track. Those of us who still sometimes confuse Peter And Gordon with Chad And Jeremy might want to tune in to “Breakfast With The Beatles” this Sunday morning on WXRT. Host Terri Hemmert has invited Peter Asher, the surviving half of Peter And Gordon, to drop by and discuss his A Musical Memoir of the ‘60s and Beyond. He’ll be presenting the multimedia show at the Old Town School of Folk Music on January 27th. I saw Asher do an earlier version a few years back at Fest For Beatles Fans - Chicago. It was an enjoyable mix of live music, vintage photographs, and film, along with his wry observations on being part of the original British Invasion. Paul McCartney used to date Asher’s sister, Jane, and the Lennon-McCartney penned “World Without Love” was one of Chad And - - er, Peter And Gordon’s biggest hits. Asher went on to become a highly sought-after producer, working with artists like Linda Ronstadt and James Taylor. Hemmert’s onstage interview with Asher after his Fest For Beatles Fans - Chicago performance showed her usual insight and love for music, so their chat this Sunday is sure to be interesting. “Breakfast With The Beatles” airs from 8:00AM to 10:00 AM Sunday morning, and can be streamed on the station’s website. A Musical Memoir of the ‘60s and Beyond starts at 7:00 PM on January 27th. Tickets are $30. When The Smiths called it quits in 1987, it was no surprise when the band'’s charismatic lead singer Morrissey went on to a successful solo career. (By the way, his current US tour brings him to the Chicago Theatre on January 25th.) Morrissey’s writing partner, Johhny Marr, the guitarist who created classic riffs for songs like “How Soon Is Now?” has also been busy since the breakup. 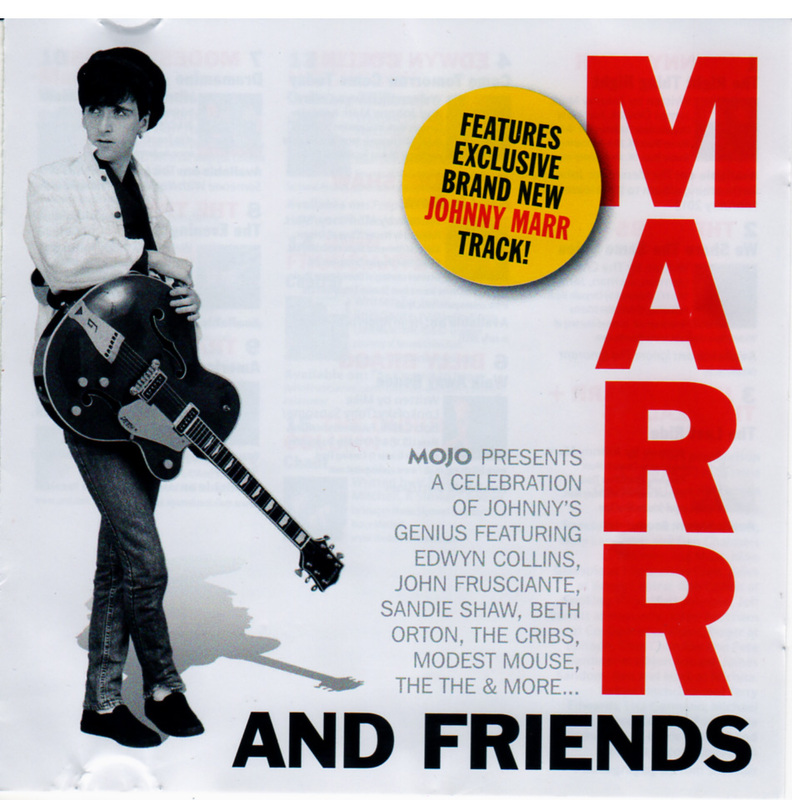 That's abundantly clear on Marr And Friends, the complimentary CD that comes with the January issue of MOJO magazine. The 15 tracks showcase Marr’s guitar playing, as well as his songwriting, on collaborations with artists like Modest Mouse, The The, Kirsty MaColl, Beth Orton, and Robyn Hitchcock. There aren't any actual recordings of The Smiths, but there is a cover of their song, “Hand In Glove,” by 1960s singer Sandi Shaw. Rather than going back to her original British Invasion days, she uses a classic and fun new wave arrangement. Elsewhere, Billy Bragg sets a funny spoken word tale to Marr's acoustic strumming on a version of The Left Banke’s “Walk Away Renee,” and Transit Kings turn in an intriguing techno effort with “America Is Unavailable.” Some of the other tracks run a little slow, but overall, Marr & Friends is worth getting acquainted with. And it comes with a pretty cool magazine. My feature story on Chicago’s critically acclaimed alt rock /country band, Dolly Varden, can be found in the January issue of the Illinois Entertainer. Singer-guitarist Steve Dawson invited me to drop by the apartment he shares with his wife and fellow Dolly Varden founding member, Diane Christiansen, late last year for the interview. It was fascinating talking to him about the band’s latest release, For A While, as well as the art of songwriting. I could swear Dawson and Christiansen don’t look a day older since I last met with them for an IE story, in 1994. 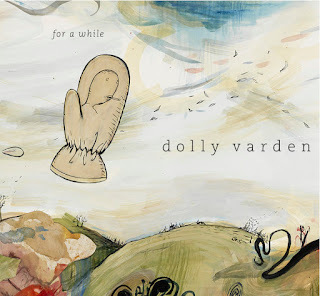 Dolly Varden will have a CD release party next Saturday, January 19th, at City Winery in Chicago before heading overseas for gigs in Edinburgh, Scotland, as well as Belfast and Rathfriland in Northern Ireland. In addition, Christiansen will be exhibiting some of her art work at the Edinburgh College Of Art. Happy Birthday to vocalist-guitarist Vicki Peterson of The Bangles. Peterson also has a side project called Psycho Sisters with singer-guitarist Susan Cowsill coming out later this year. The two previously worked together in The Continental Drifters. Shoes have accepted an invitation to perform at this year’s SXSW music festival in Austin Texas, according to a Facebook post from the band. The date is March 13th at the Holy Mountain venue. The three founding members, John and Jeff Murphy and Gary Klebe, have also been penciled in to participate in a panel discussion on March 15th, but the band is waiting for more details before confirming that part of the deal. There’s also a rumor that Shoes are considering a few gigs in the Midwest as well. Chris Stamey of The dB’s has a new CD on the way. Lovesick Blues is now available for pre-order from Yep Roc Records. I couldn’t find any mention of him going on tour, though. People looking to discover more about Chicago’s vibrant live performance scene will get plenty of opportunities when the very first Chicago Theatre Week takes place from February 12th through the 17th. The festival will offer discounted tickets to productions by Second City, A Red Orchid, Lookingglass Theatre Company, Chicago Shakespeare Theater, Bailiwick Chicago, ComedySportz, Goodman Theatre, Shattered Globe Theatre, Steppenwolf Theatre, Black Ensemble Theater, Laugh Factory, Victory Gardens Theater, and numerous other groups. It’s highly recommended that patrons get their tickets in advance. The Paul Collins Beat, one of the best of the early power pop bands, returns to Chicago on February 7th for a gig at the new club, Township. Little Boy Jr. and Blizzard Babies are also on the bill. Located at 2200 N. California, Township is a short walk from the Blue Line Metra stop. The Handcuffs and The Wanton Looks have performed together at a number of Chicagp area clubs, and they'll be doing it again for a double bill at the brand new 27 Live club in Evanston, on January 19th. Self-published authors searching for ways to promote their efforts would do well to follow the example of Young Adult/Sci-Fi author Susan Kaye Quinn. Full disclosure: She and I belong to the same writers group. Quinn, who was recently named as a panelist for utopYAcon coming up in Tennessee this June, skillfully works social media to promote her Mindjack Trilogy, and recently supervised the filming of a trailer in New York. To find out more check out Quinn’s website. 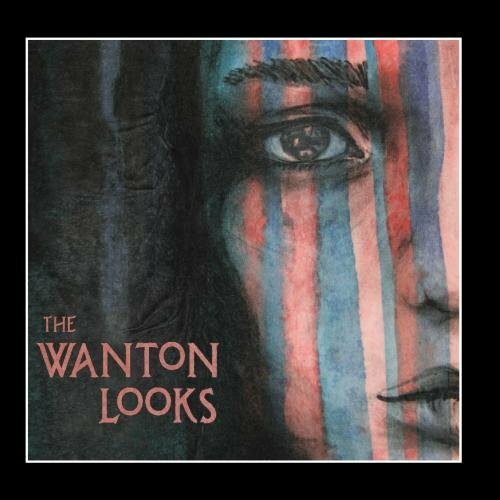 On their self-titled full-length debut, The Wanton Looks use high-speed and impossibly catchy arrangements while depicting the various ways a relationship can implode. That approach has resulted in some critics comparing the Chicago-based band to The Buzzcocks, as well as Joan Jett & The Blackhearts. The brash attitude on these 13 tracks should also please fans of The Friggs, a four-woman group fronted by singer-guitarist Palmyra Delran in the 1990s. The Wanton Looks tackle other subject matter as well. Trouble and Thomas propel the nightmarish but rollicking “Demons,” which is a must for any Halloween party playlist. “G.O.P. Greedy Old Pigs,” a blast of left wing politics, isn’t on this disc, but can be found on the band’s website. The Wanton Looks will be on a double bill with The Handcuffs at the 27 Live venue in Evanston on January 19th. 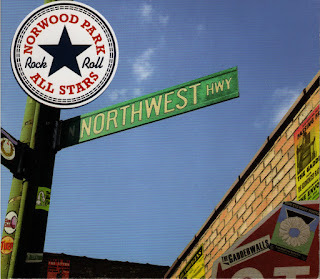 Norwood Park All Stars is a rotating collection of musicians who forged a punk scene dubbed ‘Norcore’ in Chicago’s Norwood Park neighborhood back in the mid-1980s. Led by vocalist Dave Bergeron and guitarist Pete Hlavach, they started recording tracks about five years ago at JoyRide Studio in the hope of rekindling that rebellious spirit. Their mission has become a rousing success, as evidenced by recently released full-length CD, Northwest Highway. The Norwood Park All Stars find a variety of entertaining mediums to proclaim their heritage on their website. It’s only January 4th, and I’m already compiling a list of shows I wish I could have seen. I didn’t make it out to FitzGerald’s in Berwyn tonight to see a double bill of the neo-psychedelic band Tomorrow The Moon and power pop artisans Pezband. Depending on what time you read this, you might still have time to check it out if you’re in the vicinity. Wouldn’t it be great if these two acts did more gigs together? Here’s an eye-pummeling video of “HeSawRed” by Tomorrow The Moon. Phyllis’ Musical Inn on Division Street in Chicago will have a strong lineup of power pop bands tomorrow night when Van Go and 92 Degrees take the stage. Both acts are veterans of International Pop Overthrow - Chicago, and both have a bass-playing/back-up singing Galassini. Left Hand Foot, formerly The Fighting Moultons, is also on the bill. As I mentioned here about a week ago, Miles Austrevich, the inspiration for the Jokes4Miles campaign, has passed away. It was touching to see the crowd of family and friends that came to his visitation on Chicago's north side last Saturday. There are two memorials planned in the coming weeks for this courageous young man who battled brain cancer with determination and a sense of humor. The first takes place tomorrow at the Museum Of Contemporary Art, at 220 E. Chicago Avenue, starting at 4:00 PM. And there will be a celebration of Miles’ life on January 19th, at the new Jokes4Miles headquarters at 3660 W. Irving Park Road. Check out the Jokes4Miles Facebook page for more information. Mega Dodo, the UK independent label that unleashed the sinister fun of 1960s-influenced recording artist and honorary Palatine citizen Mordecai Smyth on the world, has some interesting new releases on tap. The Honey Pot is a quartet whose latest release, To The Edge Of The World, is an overflowing garden of psychedelic tunes. The Green Question Mark’s Pegasus EP features a cover of the 1960s Hollies song, “Pegasus,” as well as the band's take on The Rolling Stones’ “She’s A Rainbow.” The previously mentioned Mr. Smyth is a member of The Green Question Mark, along with intriguingly named musicians, Marrs Bonfire, Icarus Peel, and Chrystal Jacqueline. Amazingly, this is the second cover of “Pegasus” I’ve heard about in the past few days. Shindig magazine had a review of an eight-minute version on a colored vinyl 45 by the band Temple Music. It’s available from the Fruits De Mer label, which is also planning a vinyl LP and 7” single Hollies tribute. The original version, from The Hollies’ psychedelic masterpiece, Butterfly, is notable as being one of the few times guitarist-harmony vocalist Tony Hicks got to sing lead. “I am determined to do a video project with much more mass appeal than my current Coffee With Jeff. Something more structured and amusing, and hopefully get some of my talented friends involved.” - Jeff Kelley, host/producer/writer of the weekly Internet show, Sunday Morning Coffee With Jeff. I’m looking forward to what Jeff comes up with, and would love to be involved. 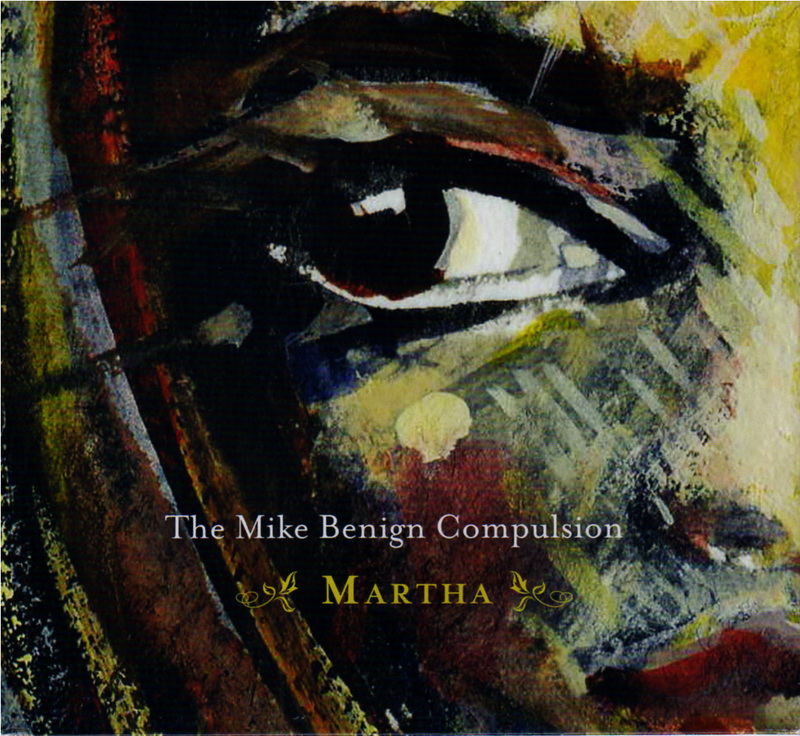 This second release from The Mike Benign Compulsion could be celebrated simply on the basis of its striking melodies and elaborate vocal interplay. The Milwaukee-based band of rock veterans plays a distinctively Midwestern strain of power pop and alt rock on Martha, which was mixed by Chris Stamey of The dB’s. Still, there are darker pleasures to be found by delving into singer-guitarist Mike Benign’s portraits of down-and-out losers and frustrated lovers. The energetic “American Dreaming And Drunk” is the most obvious juxtaposition of stinging lyrics and fetching music, while some of the other tracks, like “My Michelle,” can be more tricky. The chorus on the baroque pop song, “I Won’t Let You Down” adds the word “again” to the title; suggesting a guy with a history of not coming through, and the good vibes generated in the Beach Boys-flavored “I’ve Never Felt As Good As I Do Now” depend on maxing out credit cards and being oblivious to other people’s suffering. On the acoustic “Tattoos Of Bruises,” Benign nails a self-destructive couple with lines like, “He made the money grow wings and fly free.” The Mike Benign Compulsion might not think much of the common man, but they do create a catchy fanfare. It's not surprising to find references to record stores and record players on Stag's self-titled, full-length debut. Or for that matter, a faithful cover of Eric Carmen's “Get The Message” from his days with Cyrus Erie in 1969. The Seattle-based Stag, fronted by vocalist Steve Mack of the UK’s That Petrol Emotion, packs a power pop wallop that harks back to an era when Cheap Trick and Carmen's better-known group, The Raspberries, pretty much released everything on vinyl. 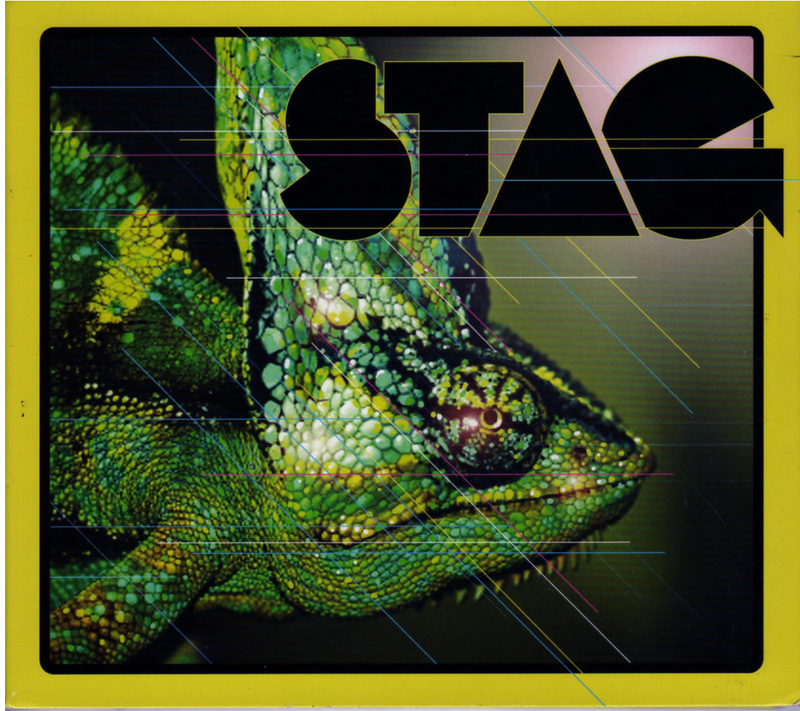 Stag's chief songwriter, guitarist-singer Ben London, draws from a variety of influences, such as The Who on the energetic “Ides Of March,” and the original British Invasion on the catchy and fun tribute to indie labels, “Love Her Records.” London's knack for satire shines through on the galloping “Chameleons,” with its images of diners fighting over a check and urgent chorus of, “What are you waiting for, you’re running out of time.” The rollicking “Tiffany Rose” depicts a woman so caught up in the latest trends, she disappears within her high fashion clothes and make-up. 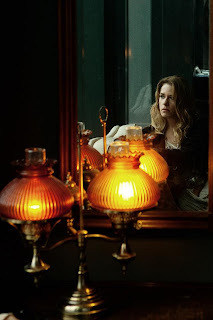 Mack offers a wide range of vocal styles throughout these 12 tracks, and creates some inventive harmonies with London and guitarist-vocalist Lincoln Barr. Photo from Vicki Peterson's Facebook page. Is this the year she goes Psycho? The Elvis Brothers once sang, “I got big ideas on my mind,” and the start of a new year always seems like the perfect time for people to present those ideas in the form of resolutions. So a while back I put out a request for musicians, writers, actors, directors, producers, artists, publicists, and all creative types to tell me what they’d love to accomplish in 2013. I didn’t promote the concept as much as I should have, due mostly to the hectic holiday schedule. I’ve decided to extend the Big Ideas concept through the month, so that people who are interested in promoting their projects can still participate. 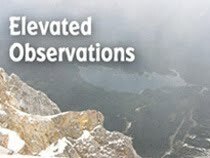 Just send your 2013 creative goal to me in care of this blog, or if we’re Facebook friends, via a message. In the meantime, here’s a mix of predictions, suggestions, and responses. “Record a new CD, reverse earth’s polarity BACK on 12/21, smile at strangers, and perfect cold fusion but keep it to themselves.” - Coed power pop band and International Pop Overthrow - Chicago regulars, The Right Tidys. So that’s how we escaped the Mayan Apocalypse! According to an email I received from drummer Bobby Elliott on October 3rd, The Hollies plan to release a live CD at some point in 2013, “to round off 50 years of making records. We then tour New Zealand, Australia, and of course, here in Britain and Ireland.” Mr. Elliott and guitarist-vocalist Tony Hicks are the only remaining original members in the band. By the way, please come to America. “I’ll be busy creating my comic strip, “Just Say Uncle,” three times a week, for Universal Press Syndicate’s GoComics website!” - Founder of power pop band The Bradburys/journalist/comic artist Dan Pavelich. SUGGESTION: If WXRT gives us another Live From The Archives this year, they should also offer something to keep all the discs in. Either a blue diamond-shaped container, or a box with the FM rock station’s diamond logo in neon on top. It should be free to anyone who can prove they own all 15 volumes from the series. “Sell one of my current books to a traditional publisher in a big house & write a new book that becomes a NYT bestseller for weeks on end. No biggie.” - Author Kym Brunner. Good Ol’ Freda was one of many highly worthwhile Kickstarter projects that appeared in 2012. It’s a film about Freda Kelly, the official secretary of The Beatles International Fan Club pretty much for the band’s entire career. Kelly was a guest at Fest For Beatles Fans - Chicago in August and came across as totally charming. Good Ol’ Freda was also one of 10 films to receive a grant from The Women in Film Foundation as part of the 27th annual Film Finishing Fund. It would be nice to see it released some time this year. “Take my creativity deeper through retreats with my fellow writers and wider by exploring different genres (MG and steampunk as well as YA SF), while continuing to grow my reader fanbase by writing and publishing fiction they want to read.” - Author Susan Kaye Quinn. At some point in 2013, promoter David Bash will hit the road and start bringing International Pop Overthrow, his traveling showcase of power pop and indie rock bands to cities in the U.S., Canada, and England. Usually, IPO hits Chicago around the middle to end of April. I’m looking forward to another 10 days of discovery and fun. “My goal for 2013 is to continue to work with incredibly cool bands. I am really grateful for the talented people I work with.” - PR Specialist at Western Publicity, Heather West. My old comedy group, Famous In The Future, has been dabbling more and more with its alt rock side project, The Rut. Expect more of that in 2013. Also, founding member/performer/writer Frank Carr has been kicking around the idea of creating a documentary about Famous In The Future, which got its start in 1989. “Continue work on our third album, which we've started recording with Daniel McMahon at The Midwest Sound in Rockford.” Mike Benign from The Mike Benign Compulsion. A while back, Bangles vocalist-guitarist Vicki Peterson created a Kickstarter project with former Cowsills member Susan Cowsill, under the name, Psycho Sisters. There have also been reports of Bangles vocalist-guitarist Susanna Hoffs wrapping up her third Sid & Susie Under The Covers collaboration with Matthew Sweet. With any luck, we’ll see both of these efforts, as well as lots of other Bangles solo and group activity in the coming year. “Focus on my craft to build stories and characters readers will remember.” - Author Veronica Rundell. SUGGESTION: The Bangles should participate in the annual Record Store Day this April by releasing some sort of rarity on 45 RPM vinyl. Maybe a version of “I Can’t Let Go” by The Hollies, which Peterson and Cowsill covered when they were with The Continental Drifters. “In response to an editor's suggestions and favorable critique of a picture book manuscript, I resolve to rewrite and create a sketched dummy/w 2 original illustrations ... and have closed my facebook accounts until I reach that goal.” - Book illustrator/writer Terri Murphy. As for me, I’m determined to actively seek out a publisher and/or agent for my three novels. I’ve just completed one set in Chicago's alt-rock scene in the mid-1980s, but need to go back and make some edits so the narrative is more unified. I’ll be writing more about this book in the near future.